The boys and I have run the Saucony Creepy Mile for the past three years. Every year, they start planning costumes months ahead of time. This year, in mid-July, they started hounding me about registering them for it. Last week, I was taken aback when Skipper announced that he didn’t want to run the Creepy Mile because he wanted to volunteer instead. Somehow, my almost 11 year old has acquired more race volunteer experience that most adults and, for whatever reason, helping out at The Trek or Treat was something that he really wanted to do. So, I swallowed my words (“But I paid for your registration already!”) and made arrangements for him to marshall and man a water station. That left Little Ironman to run The Creepy Mile with me. 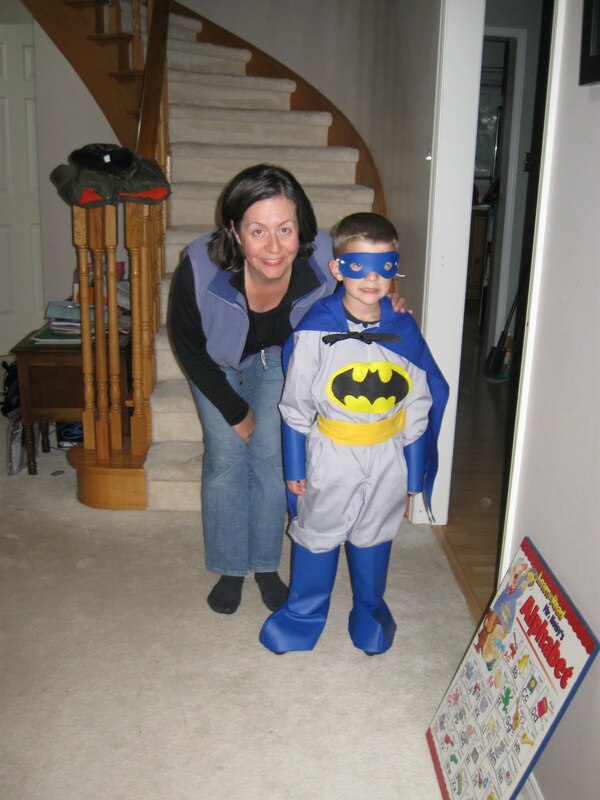 In July, LI entrusted Superfriend Katherine (pictured with LI) with one of his favorite Batman characters so that she could make his costume. When she dropped it off last weekend, LI was delightfully speechless. He had spent many, many nights dreaming of becoming his Superhero. However, on Friday night, just 15 minutes before we were about to leave, LI said that he didn’t want to race. So I did what any mom would do; I threw his costume in a bag and took it with us, hoping that he would change his mind. “Four minutes until the start of the Creepy Mile” we heard on the PA.
With Superhero speed, we peeled off his shoes, put on Batman’s suit, mask, hat, utlitly belt, gloves, boots and his own shoes again, and headed to the start. Hundreds of children and their parents already left. LI wasn’t at all phased, though. He started to run but, within seconds, realized that Mom was right and he should wait until after the race to put Batman’s boots on. Daddy was now on the scene and, together, we pulled off his running shoes, pried off his boots, stuck LI’s feet back into his shoes and started to run. LI stopped again, this time to take off his hat for Daddy to hold. And, we took off again; this time was the real thing. Gone. Somehow, Daddy dropped LI’s mask in the dark. I suggested that I run back to look for it but LI wanted to run with me (probably because of my own sidekick alter-ego). He didn’t whine, and he didn’t cry. Without thinking twice, he started to run again. Just before the halfway point, I realized that Batman’s utility belt had fallen off. I asked Dave if he had, really hoping for a yes, but it was definitely missing too. We said nothing to LI. Shortly after, LI stopped at the water station, completely focussed on being able to get a drink rather than a candy bar in the orange bowl. He had a few sips and, then, handed me his cup. “I’m all done,” he innocently said, leaving me forced to finish his water and return the cup rather than toss it on the ground as I normally do; he wouldn’t have understood that. Then, we headed back into the cemetery and raced to the finish. He was happily tired. If we take off the time missed at the start, Little Ironman (still 5 years old) ran a sub-10 minute mile. I was really proud of him, especially when some of my 9 year olds at school can’t run that fast. And I was equally proud of him for not being upset about his missing accessories (yes, we told him about the belt after he finished running). I ran back along the course later that night to try to find them (a mother’s love can make you do crazy things; it was really dark and lonely that time) but had no luck. With Halloween only a week away, Superfriend Katherine is quickly putting together another utility belt and I’m working on a mask. Batman will run again. Both boys had a great night. LI was excited about running so well and proud of his finisher’s ribbon and Skipper loved being able to volunteer. I’m sure that we will return next year, one way or another, for this spooky family run. What a great story! Congrats to LI! You have superfriends and superkids. And that is an impressive mile time!